Monday 16th April at 6pm, will be the first practise night, (roll up). All are welcome, there will be refreshments of wine, nibbles, tea, coffee. Come along and meet a friendly group and have some fun. details of matches in next month’s magazine. Any enquiries, Chris Dudman 01798 869274. Sutton Bowls Club, Fixtures for the 2018 season. Wednesday 29th August 5.30pm home Midhurst. Practise nights Mondays or Wednesdays 6.30pm, unless matches. Members and new talent are always welcomed! You can play for fun on practice nights or look to join the team for matches. Either way the annual subscriptions is £40 per person (we need this for insurance which is obtainable only if we have a list of paid up members). The extraordinary meeting was held in the Bowls club Pavilion, on Monday 6th November, at 6pm. We had a good attendance, to include one former Trustee , Bob Carroll. Stuart Dallyn thanked all those for coming, and for an excellent bowling season, this our first. Committee: Diane Snowden, Rita Berry. Trustees: Bob Carroll Tom Tupper Michael Dallyn. Membership is included to anyone who pays the yearly fee of £40, whether roll ups or matches, with 2 free sessions to start. Anyone can become a ‘friend’ of the club and pay £40, but not wishing to play, just support. Concessionary rates for under 18 and students. The green will be open for roll ups twice a week, depending on matches, it will be Mondays and Wednesdays. Season starts 1st April, weather depending, for 6 months. The sponsored walk has so far, made in excess of £2000 for our much needed funds, the green will need each year about £1,000 to £1,500 to maintain, and the Pavilion needs work and money spending on it. Tom Tupper Chaired the meeting and thanked everyone for their hard work and support this year, and thoroughly enjoyed his first bowling season. if interested please contact Sue Dudman, Secretary, 869274, or any of the bowlers listed above. Well, well – I was right (‘not a common occurrence, according to Mrs S), we’ve actually won a bowls match! 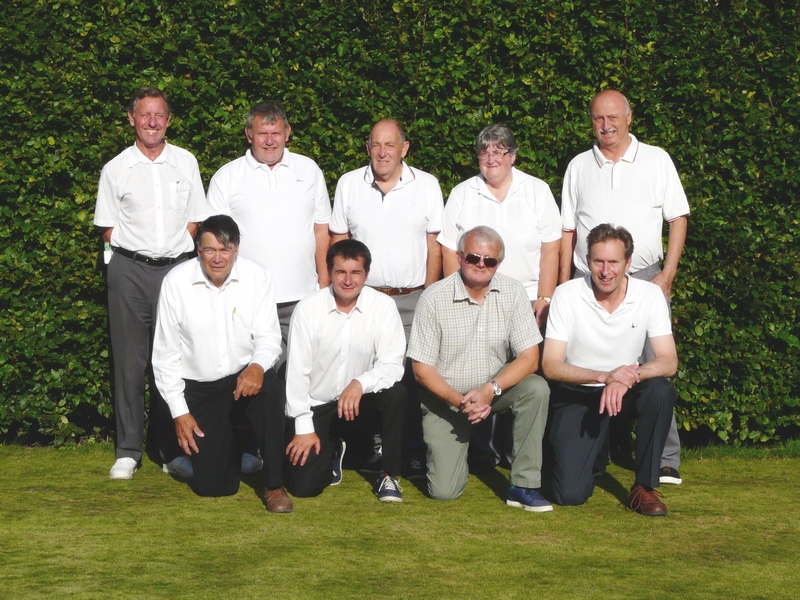 Wednesday 19th July saw Sutton Bowls Club host its first match for a perhaps three years. The privileged visitors on that occasion were Fittleworth, who only two weeks prior, had recorded a 3:0 win against us. In fairness, our victory against them was a narrow one. My contribution was reliably indifferent (sorry chaps), whereas Chris Dudman’s team were victorious (cunningly assisted by Sutton donating a couple of players to the opposition). Stuart Dallyn and his cohorts chalked up a most satisfying win over Fittleworth’s strongest trio, with Stuart’s very last wood of the match ‘skilfully’ ricocheting off several others to clinch the narrowest of victories from the jaws of defeat. 2:1 to Sutton! Our post-match supper was a revelation, especially given the Club’s basic facilities (no electricity or lighting!). The quality of the offering was to the great credit of Sue Dudman and Sue Harding, assisted by Caroline Pontin. Moreover, in the days preceding, Chris Dudman and Jeremy Pontin had thoroughly cleaned and redecorated the toilets, while the two Sues had cleaned the whole of the pavilion. A tremendous and dedicated effort by them and others. Also, deserving of praise is the ongoing hard work of Stuart and Anthony Harding restoring and caring for the green – this is constant and very time-consuming and all undertaken without charge to the Club. Since that auspicious occasion we’ve hosted three more matches in August – and are comfortably back on form. We lost to Arundel (2:1), a match for which I was deservedly dropped; to Southwater (3:0) on a lovely, sunny afternoon and narrowly to Graffham (2:1. Southwater was a last minute fixture, in which Stuart’s own team had been leading throughout, only to lose by one point – much to his chagrin (but, “what goes around…”). The Graffham return fixture was a close-run thing, with scores about even half way through, but the visitors did just enough to win by 11 points overall. There should have been a match against Petworth on 26th July, only this was cancelled due to heavy rain. We still have two more matches scheduled – 23rd August (Pulborough at home) and 30th August (Petworth away). Who knows, could there yet be a second victory? The support for your club this season has been terrific, but more members are still sought – whether as recreational players or match fodder. The atmosphere is casual and very welcoming. Roll-ups are still happening (other than match days) every Monday and Wednesday from c. 6.15pm. Please don’t think this is a game just for old men (although a lot of us are) – we do have the odd young person and we also have some very talented women players, including Caroline Pontin, Sue Harding, Rita Berry and Diane Snowden. So go on, give it a whirl.